This is an introductory course on chakras for the beginner who is interested in understanding their chakra energy to being able to clear and balance chakras for themselves and for other people. Please Note: This workshop is 4 hours in duration (not 3) due to the amount of hands-on training involved. Any ache, pain or illness is due to a chakra that is blocked or imbalanced in its energy. When you understand how you are blocking the energy of your chakra centres, then you also have the power to be able to dissolve blockages. 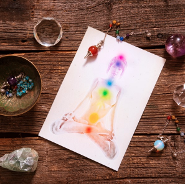 This is how we can energetically balance our body and bring it back into a natural state of harmony and this is what you will learn at the Chakra Workshop. This workshop allows you to delve more into the world of chakras with like-minded people. It is a relaxed day with plenty of opportunities to ask questions. The price for the course is $75 and this includes training, course material and tea or coffee. You simply need to bring your own snack and a pen. A minimum of 4 people and a maximum of 6 people per class. If you have a crystal pendulum at home, you will also need to bring that with you to use. If you do not have a crystal pendulum, you are welcome to purchase one at the workshop. They are $10 each. (This price is for workshop participants only) Private group workshops are also available here. Teens (13+) are welcome to join any chakra classes on the calendar as long as they have their parent/guardian participating in the class as well. Cost is the same for each person. The course is being held in my Healing Home in Gowrie Junction. Places are limited so prepayment is needed. HOW TO PAY : I will email you bank details to make your payment to when you fill out the booking form. Want to book a workshop on a date that suits you?